1. Kids are supposed to learn to read until 3rd grade, but after 3rd grade, they read to learn. 2. If kids are not reading at grade level by the end of 3rd grade, they are more likely to drop out of school. 3. Students with chronic absenteeism can never catch up to their peers. By addressing issues such as asthma and tooth pain, which are leading causes of chronic absenteeism, these students are more likely to succeed. Could the library create a new partnership with the public schools to focus on meeting the needs of the students who are not reading on grade level at the end of 2nd grade. 1. We learned the four types of energy : spiritual, mental, emotional and physical and to fully engage these means being :Physically energized, emotionally connected, mentally focused and spiritually aligned with a purpose that is important to you. 2. We learned about having a Full Cup. When we fill ourselves with things that give us positive emotional energy it spills over into everything else we do. 3. We learned the SOSS model for emotional management and expression. S-Stop and slow down (count to 10) O-Oxygenate (take some deep breaths) S-Strengthen appreciation (literally think of appreciating someone or something. It engages your pre-frontal-cortex) S-Seek Information (learn more about the other person's point of view....it may even buy you some time before you respond). 1. The achievement gap between low income and high income families is evident in children as young as 9 months. 3. WCPS has a birth to five program that covers the entire county. Free resources for children in need, such as a speech pathologist, occupational therapist, and physical therapist who will come into the home to work with children. In order to access this resource, a referral must be placed (this is normally done by a pediatrician). One of the topics that came up repeatedly was how many at-risk children come from families where English is not spoken or is not the first language. Perhaps libraries could offer some support to parents who do not speak or read English well by offering adult literacy programs that could be co-sponsored with another organization in the area. 1. Movement activities for story time, such as going around the circle to create a movement with your name - at the end you've created your own dance as a group, and the mirror game where one person leads the group and they must imitate slow movements as if looking in a mirror. 2. Free resources available from education.wolftrap.org - create a free login account and access resources to implement the arts (drama, music, and dance) into story time and programming. 3. Children naturally learn through art integration - this provides active learning and can reach children with special needs, do not speak English as a first language (or at all), and kids who learn in different ways. Many options to implement movement, dance, drama, and music into story times. I've tried to implement the name movement introduction/dance with a story time with mixed results. The kids were very interested in watching me do it, but were shy to participate themselves. I think incorporating more movement and leadership opportunities (allowing kids to lead the group) would get them more comfortable with the idea. I learned what the social networking tweens are now using, snap chat, twitter, vine, etc. I learned about options of separating out collection for tweens. When we do programming, maybe use some of the social networking that is most popular to bring more tweens in. I am anxious to try out some of the program ideas. I will try to encourage more participation at the library to tweens. Additional learning: Trying out the different social media networking. GED tests are now completely online. Start a conversation or meeting by asking, "What's gone well for you since the last time we talked?" Practice the WWW exercise daily for one week and see how it changes your perspective. Share with staff - in 200 studies on 275,000 people worldwide: happiness leads to success in nearly every area - work, health, friendship, sociability, creativity, and energy. When people work with a positive mind-set, productivity, creativity, and engagement improves. Dedicate a computer for GED testing at branches. There are several different ways styles of leadership and many of them overlap. Leaders establish the positive conditions of wellness, recognition, empowerment and significance. Risk taking is a part of leadership. Every time you try an new initiative you are taking a risk, but you should always be willing to try. I see WMRL's new Strategic Plan as an opportunity to take some risks with new initiatives. Behind the Executive Door by Karol Wasylyshyn is a book that was recommended in one of the programs I attended which I plan to read. 2) The more Jill Craig and Mary Manix spoke about "the dead" I became more intrigued with the thought of looking up my own "dead people"
3) I didn't know there were so many free websites and books from other libraries that a person could find out so much information on one individual. Additional learning: when I'm actually going to start this I know where to go for help...starting with Jill! 1. Published histories add material not found in census data. The Source: A Guidebook to American Genealogy and Printed Sources: A Guide to Published Genealogical Records list sources. Many libraries like WCFL's Western Maryland Room and FCPL's Maryland Room collect only local family histories, but there are libraries that collect more broadly, like Mid Continent Library http://www.mymcpl.org/genealogy and Allen Public Library http://www.mymcpl.org/genealogy and might be willing to either answer a question based on the book or ILL a copy. 2. Heritage Quest includes PERSI (Periodical Research Index) as well as census. PERSI could be used to look for a family name in an article. These resources could add to what I post on whilbr. I traditionally search ancestry.com for some information about a person I am referring to. Looking at published family histories could add to this info. Additional learning: Family Search requires Internet Explorer. I had deleted it from my computer! Gwinnett County Public Library (Georgia) has a dynamic duo (their Training Manager AND their IT Division Director) working on maker programming - not maker spaces. BIG difference. First, they did trials which they called Maker Camps. They had two of them; one in the summer of 2014 and one in the winter of 2014. They partnered with a local school both times but in the summer, the program ran for 4-days, 3-hours each day. In the winter they changed it up a bit to 3-days, 4-hours each day. Both camps were scheduled around school holidays/breaks. At the camps, the kids worked with Makerbot Replicator, TinkerCAD, Google Drive, and Makerbot Mini. The next step was to get the local school library media specialists involved in order to have a special event in conjunction with Teen Tech Week. So, they had a program which featured the history and future of 3D Printing and each participant got to print one item from the Thingverse online catalog. It was interesting that they held these events in the open spaces of the library rather than in a meeting/programming room. Having the events out in the open generated more interest as library customers came in, saw what was happening, and asked questions. It wasn't disruptive but rather eye opening and a great way to market/communicate! For staff, they held their own staff maker camp and they ran it very similarly to how the kid maker camps were designed EXCEPT they added a session on troubleshooting. They also incorporated Lynda.com resources, lots of hands-on experience, and they dedicated a lot of time to WHEN THINGS GO WRONG. I would love to do this or something like this for staff in western Maryland if there is interest. The tricky part is staff being able to attend three consecutive days - even if they were only 4-hours - due to staffing constraints. I think having the consecutive training is important to make the learning stick but I feel like we'd have to switch it to maybe 2 sessions a week for 2 consecutive weeks. That might be more feasible. If you're reading this and you're one of my colleagues in Allegany, Garrett, or Washington counties, please email me and let me know what your thoughts are. Brown Dog Gadgets is a great resource for programmables. I would describe this event as a highly interactive technology & coding petting zoo. I got to meet people who are providing new technologies for libraries to use in various ways. This was a pretty timely event as it nicely complemented the Coding in Libraires training that I had just attended the Thursday prior. What kinds of technologies did I get to see/experience? Arctec Eva 3D Scanner - no 3D design skills needed; just point, shoot, scan, print. Lots of programmable robotic toys like Ozobot, Sphero, and Circuit Scribe. You may recognize the squishy circuits - 2nd from the right. Well, Jennifer Hopwood (SMRLA) and I talked about possible coordinating staff development programming with NASA on using LittleBits in coding programs. Based on the feedback I've heard about the Code in Libraries workshop, many of our staff want/need additional practice with these technologies before they feel comfortable facilitating a program on their own. Perhaps, NASA could provide that programming link? I even made my own light-up badge! I also think this is important information to share with the WMRL Technology Interest Group since they are kind of tasked with staying on top of tech trends, etc. . .
LibraFor me, this conference developed a theme: "Linked data and the semantic web"
Libraries are not well-represented in Google results (nor other search engines), especially results based on the latest "knowledge graph" techniques, because we are not taking advantage of the markup possibilities in schema.org, the vocabulary being developed and used by all major search engines. In particular, creative works (books, music, movies) can be described in these schemas and then be much more accessible to search engines, but libraries' MARC format is not accessible in this way. OCLC is working on how to use schema.org model for library cataloging, and LC is developing BIBFRAME, the Bibliographic Framework Initiative, as a replacement for the MARC format. I will work with Maria to learn more about how we will be affected by BIBFRAME and how we can take advantage of it and schema.org. Each of the above will go on my to-do list! Since we decided not to purchase CollectionHQ, being able to replicate some of its functions will be very useful for selectors and branch managers. Our current system for tracking receipt of periodicals is time-consuming and idiosyncratic - using the serials module will be more efficient. A welcoming email to new patrons would be useful in conveying policies and information. 1. Learned about circuits and how to make squishy circuits and paper circuits. 2. 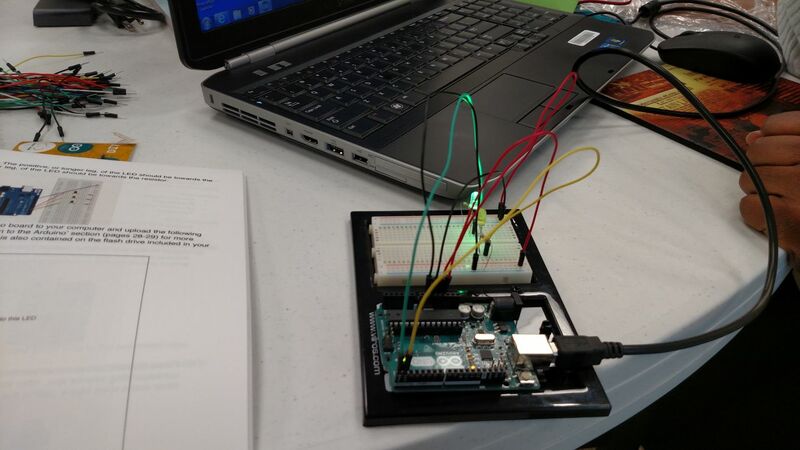 Learned how to use an arduino and a raspberry pi. 3. Learned ways we can incorporated these different technology devices into programs at the library. As a part of this training/program, each library branch got a coding kit, which was purchased by WMRL (THANKS SO MUCH!) The kits were all inclusive (more than I was expecting), so they are ready to go and ready to be used by kids and teens alike. I hope to share the information I learned with the branch managers and other staff so that they can take full advantage of these awesome resources! 1. Determining and Demonstrating Value with the Logic Model By adopting the Logic Model (developed by IMLS to create Outcome Based Program Evaluations), the library can measure the outcomes, and eventual impact of their programs and services. 2. Net Promoter Score (talked about by Stephen Denning) Every company's customers can be divided into three categories: Promoters, Passives, and Detractors. Ask one simple question: How likely is it that you would recommend the Washington County Free Library to a friend or colleague? Customers respond on a 0-10 scale. Promoters score 9-10, passives score 7-8, detractors score 0-6. To calculate the NPS, take the percentage of customers who are Promoters and subtract the percentage who are Detractors. Are we really a customer focused organization? Prioritize the tasks/problem/projects Take the top priority tasks (1 or 2) and assign the top people to complete the task in 3 weeks. Evaluate the solution. Will it work? Does it need refinement? Do you need to start over? I was intrigued by the Net Promoter Score as a way of measuring how well you are succeeding as a customer-driven organization. Will be conducting a survey of WCFL patrons to see how we are doing. I also really like the idea of re-vamping a library volunteer program to have volunteers share their passion and expertise by creating programs at the library. I would like to see WCFL adopt the Logic Model as the standard program planning methodology, as well as use this approach in developing our next strategic plan. Teaching Circuits, like the "Squishy Circuits" we made out of Play Dough and 9 volt batteries and LED lights, is a great way to help children grasp the logic and concepts behind computer code. There are a lot of games to help kids grasp coding as Blocks of Coding Language. Having mini-computers, like the Arduino, make it easier to understand the working "guts" of the computers, which also help kids learn to code. 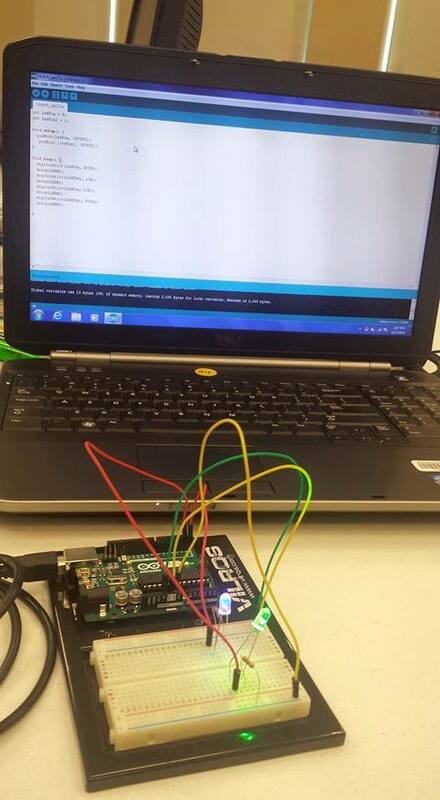 We will definitely be offering some of the coding programming at our library soon, like the LED and conductive thread bookmarks and some more of the great coding resources. Can't wait to get more time playing around with the Arduino. Learned how to create a squishy circuit and a parallel circuit. Looked at different block based programming languages such as scratch. Programmed an arduino to switch and LED on and off. Learned how to set up a Raspberry Pie. All of these ideas could lead to library programs and classes for all ages. This class was very technical. More training in these areas would be needed before I would be comfortable leading a class in these areas. I hope to begin planning upcoming programs that use coding and different circuitry tools to teach kids and teens the same things that I learned in the program. I would like another class that provides program ideas that can be done with these different tools that we gained a basic understanding of. Now that I have a basic understanding and idea of how to use the tools, I would like to create a list of program possibilities.